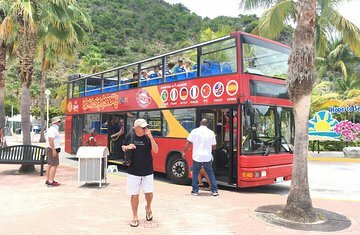 Fahren Sie durch das malerische St. Maarten und sehen Sie auf dieser 3,5-stündigen Doppeldeckerbus-Tour ab Philipsburg, was die Insel zu bieten hat. Sehen Sie sich die Tandemregel Frankreichs und Hollands auf dem einzigen Doppeldeckerbus der Insel an und halten Sie an zahlreichen lokalen Sehenswürdigkeiten für einen Besuch und ein Foto. Spazieren Sie am Orient Bay entlang, bestaunen Sie die französische Architektur von Marigot und erkunden Sie während dieser spektakulären Tour durch die wunderschöne Insel den Maho Beach. Diese familienfreundliche Erfahrung ist der perfekte Weg für Erstbesucher, um die Insel zu sehen, und ist für Reisende jeden Alters ideal. This tour is primarily for cruise-ship passengers, so it picks up at the Cruise Terminal in Juancho Yrausquin Boulevard - a 20-minute walk from the centre of Phillipsburg. Owing to security at the terminal, you get picked up just inside the exit gate. You need to confirm your booking 24 hours in advance and that's the time to get the operator to reserve your seats otherwise you get only what's available after the cruise passengers have boarded. Our tour was unable to enter the French side of the island owing to severe damage caused by hurricane Irma in September 2017 but you do get a good 3.5-hour tour of quite a lot of the Dutch side and it's better to see things from the top deck of a bus. Stops are made at the Topper's rum distillery including free samples, the famous Maho beach where aircraft fly very low on approach to SXM airport and an ice-cream parlour with free rides on their carousel. Commentary on the tour fights to be heard against the background music it is played through headphones which are already set up in the bus. Unfortunately, one or two errors have crept through - e.g it refers to Prince Juliana Airport at one stage! This was a great way to see the entire island! Even though the stops were a little short for me, getting over to Orient Beach was awesome. I had visited before and getting over to Brothers was a must for me. Shout out to the owner, Monique! Brothers makes the best guava berry coladas on the island! If you make it to Orient Beach go by Brothers for your guava berry colada! You will not be disappointed..